Wrote this little diddy to convert an Excel 2003 file to Excel 2010 file. Created this BitLocker recovery guidance information for a client recently. Not overly technical, but I thought it would be useful to share. If a computer should be unexpectedly prompt the user for a recovery key, use following high-level steps to correct the system and help prevent future unnecessary BitLocker security trips. This is additional information as provided by Microsoft to help isolate causes of BitLocker recovery. It should be noted that integrity check failures are not a result the Windows 7 image. Recovery mode being initiated is a sign of BitLocker successfully detecting and interpreting a possible threat. 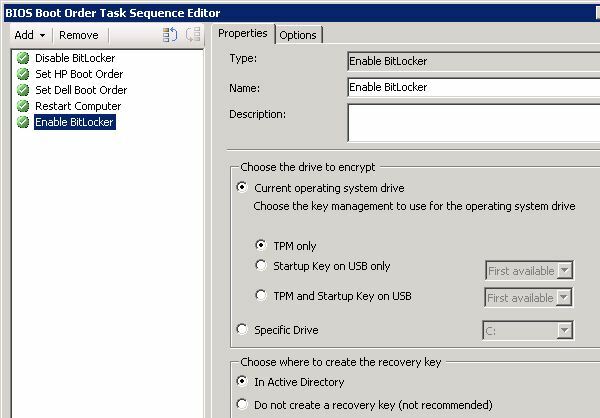 The following types of system changes can cause an integrity check failure and prevent the TPM from releasing the BitLocker key to decrypt the protected operating system drive. Changing the BIOS, master boot record, boot sector, boot manager, option ROM, or other early boot components or boot configuration data. This functionality is by design; BitLocker treats unauthorized modification of any of the early boot components as a potential attack and will place the system into recovery mode. 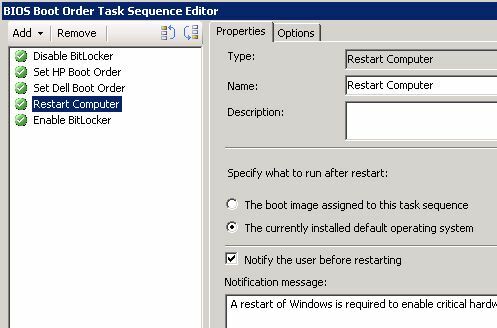 Authorized administrators can update boot components without entering recovery mode by disabling BitLocker beforehand. The following list provides examples of specific events that will cause BitLocker to enter recovery mode when attempting to start the operating system drive. Microsoft’s full list has been reduced and categorized for ease of reading and potential scenarios that may occur. When you are installing additional language packs onto the system, and selecting the option to apply the language settings to all users and system accounts. 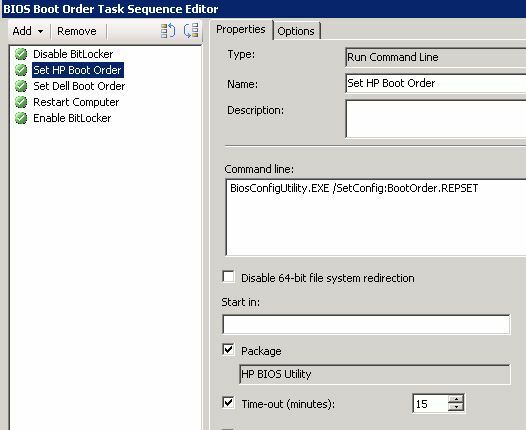 This causes a locale change in the BCD (Boot Configuration Database), which BitLocker with TPM interprets as a boot attack. Having the CD or DVD drive before the hard drive in the BIOS boot order and then inserting or removing a CD or DVD. Upgrading critical early startup components, such as a BIOS upgrade, causing the BIOS measurements to change without first suspending BitLocker protection. Changes to the master boot record on the disk. Changes to the boot manager on the disk. 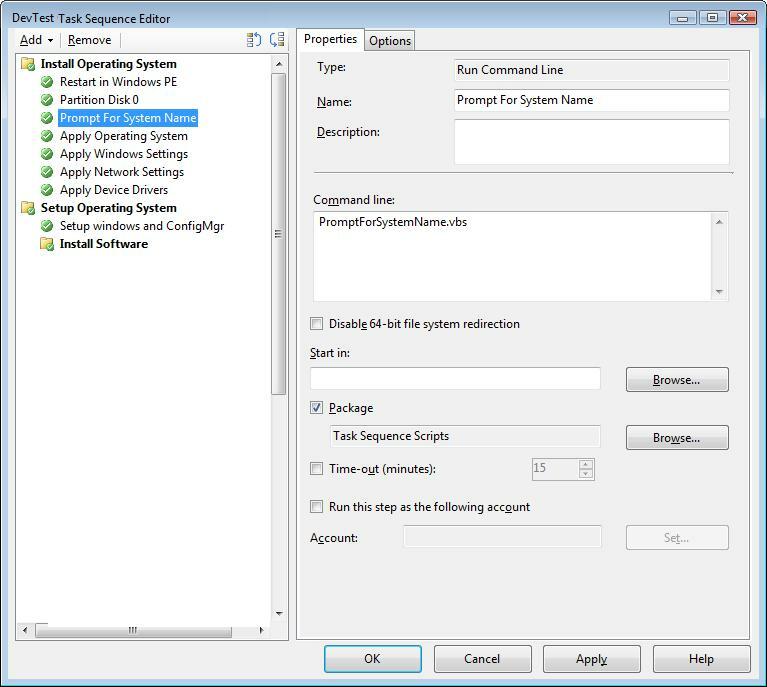 Changes to the NTFS partition table on the disk including creating, deleting, or resizing a primary partition. Docking or undocking a portable computer. In some instances (depending on the computer manufacturer and the BIOS), the docking condition of the portable computer is part of the system measurement and must be consistent to validate the system status and unlock BitLocker. This means that if a portable computer is connected to its docking station when BitLocker is turned on, then it might also need to be connected to the docking station when it is unlocked. Conversely, if a portable computer is not connected to its docking station when BitLocker is turned on, then it might need to be disconnected from the docking station when it is unlocked. Adding or removing hardware. For example, inserting a new card in the computer, including some PCMCIA wireless cards. 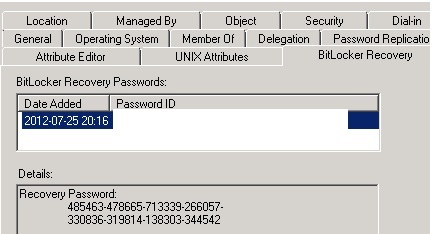 Disabling the code integrity check or enabling test signing on Windows Boot Manager (Bootmgr). Adding or removing add-in cards (such as video or network cards), or upgrading firmware on add-in cards. A platform validation profile consists of a set of Platform Configuration Register (PCR) indices. Each PCR index is associated with components that run when Windows starts. Per a support forum thread: Dell Support recommended to shut off PCR 0 and 2 and test further. Please understand that this will further reduce security from the default configuration. Document the software installations that are being completed manually. Install software during encryption of the disk then restart Windows to determine if that caused a change. Note: if a PCR is tripped, it will be logged into system events, but not the specific PCR that changed. Other events surrounding that registered change can be evaluated as a possible source. Note: Windows Updates have built-in logic to not trip BitLocker into Recovery Mode. Update or modify BIOS to a newer version only after suspending BitLocker protection. Remember to resume protection after the changes. This entry was posted in Troubleshooting and tagged BitLocker. Found an issue with LM 2007 on Outlook 2010 on a recent deployment. The LM client (version from May 2011) is configured to use the Live Meeting Service from URL (such as https://www.livemeeting.com/cc/CompanyName). If the user’s Outlook profile is NOT configured to use cached exchange mode, then a scheduled live meeting gets an undeliverable message. If cached mode is off, a workaround is to change the “From:” field to use “Live Meeting Transport” instead of “Microsoft Exchange Server”. Microsoft has confirmed this is a known issue, though I do not know if a KB has been publicly published. A recent challenge I had with a USMT migration was to ensure that all .pst files could be migrated (or any file type for that matter). You may be asking how that is “challenging”. Well, a common best practice is to exclude unnecessary directory locations (such as C:\Drivers or C:\Temp), so what happens if the .pst file lives in that folder? 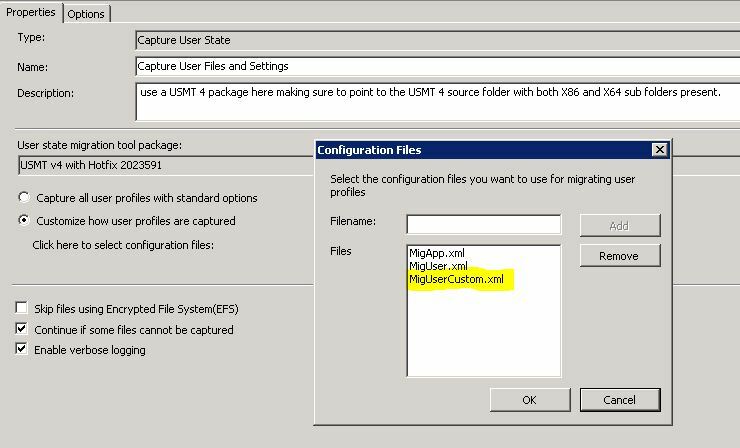 Furthermore, if USMT using MigApp + MigUser, then program/system directories are excluded (such as user’s temp folders or C:\Windows), so what happens if the .pst file lives in that folder? In either situation, if the .pst is actively connected to a user’s Outlook profile being migrated, then the .pst will also migrate. However, if the .pst is disconnected and lives in an excluded location, then it will not migrate. So this brings the challenge of how to migrate .pst files. The solution is to use a customized migration XML file, which in this example I am calling MigUserCustom. 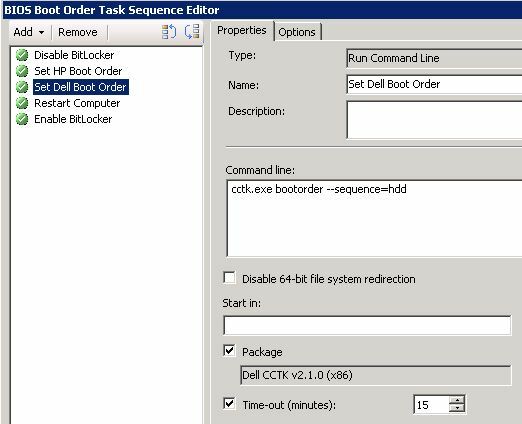 Or if you have defined in an SCCM task sequence, be sure to add it as one of Configuration Files. This entry was posted in ConfigMgr 07, Scripting and tagged USMT.